My challenge to watch the TOP 250 films in the IMDB site continues. This is my 5th review, 121 films remain. Today, it is my pleasure to review yet another movie that greatly deserves to be ranked among the best films of all time. The movie is “Patton” and it follows a man: the famous general George S. Patton during the allied offensive of WWII. Unlike other contemporary war films that concentrate on the human drama on the ground, this movie is a character study of the famous General Patton who found, in war, his natural habitat. 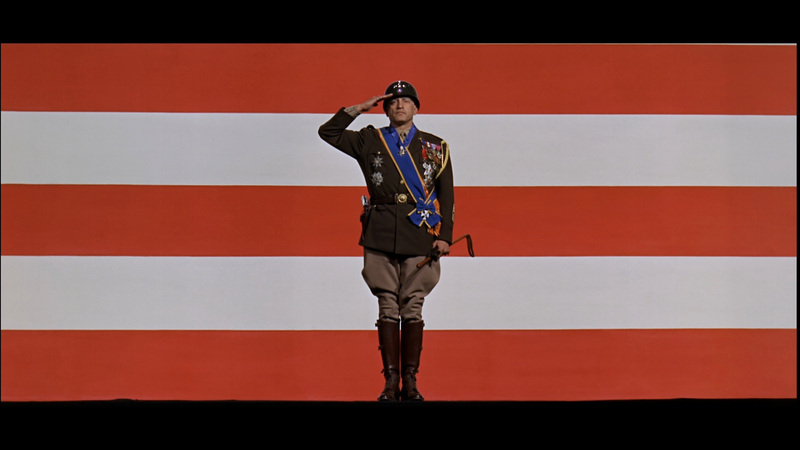 Patton is a film that, for most of its running time, remains behind enemy lines, away from the front line action, but intimately close to one of the protagonists of the conflict. The complexities and nuances of a man that was vital in the success of the Allied offensive was masterfully captured by the underrated George C. Scott. It is, without a doubt, an epic performance, almost theatrical in its grandeur. Scott’s portrayal of General Patton achieves, despite the larger-than-life scale of his character, a great believability. He played a man that did not see war as his obligation to his country or as an opportunity to test his manhood, but as his ultimate purpose, his only cause, what truly defined who he was as a man. Patton as most other generals, spent a significant amount of time politicizing and framing inside make-shift offices the destiny of WWII. He saw it as a necessary part of war, one he was not particularly good at. In fact, while his victories on the field were impressive, politics were not his forte and often, he found himself at odds with the High Command. What is shown in the film are not so much his struggles on the field, but rather his shortcomings as an off-the-field officer. He is often stuck as a spectator to what he considers to be the chance of a lifetime due to his controversial political persona. It is in the midst of this situation that the film takes off, showing us a man ridden with a sense of helplessness and frustration that is in sharp contrast to his incredible confidence on the field. As a character study, Patton constructs enough of an image for us to place the rest of the missing pieces of the puzzle. We get a sense of what he wants or desires, but there is always an element of surprise in his actions that make Scott’s General one of the most excitingly complex and mysterious film characters ever. As it often happens with other great films, a rather unlikable character manages to grow fonder in our eyes as the film progresses. Patton himself admits to be the target of hate and fear among the men he commands and we can sure see why. However, we fall in love with his passion and conviction to defeat his enemies, which is portrayed, without much restraint, over the course of an unforgettable biopic.